New Zealand’s swift-flowing rivers dissect steep, broken country making them ideal for generating cheap hydro power. The vast amount of energy contained in major river systems like the Waikato and the Clutha has been tapped through a series of hydro dams. The stored water is converted into electricity by moving it through penstocks into huge turbines, which generate electric current. New Zealand got an early start into the production of hydro electric power when a private station was built in 1887 for the Reefton gold mines. This West Coast town was the first place in New Zealand to enjoy public street lighting. The first government station was built at Lake Coleridge in 1914. The South Island has the two largest power stations, Benmore and Clyde, each producing around 500 megawatts. However, as the South Island holds only one quarter of the country’s population, the surplus energy is delivered to the North Island via the ‘National Grid’ - a network of high voltage transmission lines carried on pylons and via undersea cables across Cook Strait. POWER SUPPLY - The standard supply in New Zealand is 230-volts AC at 50 Hertz as in Europe and Australia. 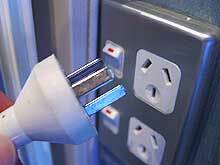 Most accommodation provides 110-volt AC wall sockets for electric razors but other appliances need transformers. Standard power sockets require three blade plugs. Campervans have 230-volt AC power systems, which plug into outlets at campsites. The vans often carry 12-volt DC systems as well to enable you to camp in more isolated sites. BALANCING SUPPLY AND DEMAND - While hydro power has continued to supply between 70 and 80% of total electricity generation in New Zealand, the reliability of the system is totally dependent on the weather. In years of partial drought, reduced inflows into the major storage lakes call for careful juggling of energy resources, usually by increasing thermal generation (starting up oil, coal, and natural gas-fired backup stations). ALTERNATIVE ENERGY FORMS - When thermonuclear power generation was first proposed back in the 1960’s, there was a public outcry. The staunch opposition continues to this day. Attention is shifting now towards more renewable resources like wind power and solar radiation.